On Christmas Day in 2003, I received my first ever camera. I think it’s fair to say that no one in my family realised how influential that moment would end up being. But 15 years, eight different cameras and a Bachelor of Arts later, photography isn’t just a hobby for me anymore but is actually part of my profession. I’m deeply passionate about creating stories on film, but photography is a fascinatingly unique medium. Freezing a single moment in time, documenting a point in history and preserving sentimental moments forever. Photographs act like portals that let us visit other places and relive those special times. So in celebration of World Photo Day 2018, I invited my colleagues to share some of their favourites. Here’s a selection of our most treasured moments captured on camera. America has always captivated me. It’s just one of those places. Big and in your face. Unabashed to be what it is and what it stands for. Yes, it has its problems, but so does everywhere. Going to New York was a dream come true. Referenced throughout my life through films, TV and music, I knew the place before I ever set foot. Although this particular photo might not be my favourite from the time I spent there, it certainly captures NYC in a way I love to remember. Taken from atop the Empire State Building, the photo seems serene, calm, accepting of its surroundings, ironic really. I’ll go back soon… maybe for good. Who knows. America has my heart. Imagine living your whole life with no one celebrating your birthday. That’s how Archie has lived his life. Apart from the occasional ‘birthday walk’ he’s gone through 10 years of his life not knowing he’s another year older so I took it upon myself to celebrate what I would consider to be a milestone birthday, double figures. Archie is the first family pet we’ve ever had and now he’s entered the senior category of his life we need to document these memories more than ever. We celebrated his day how all good birthdays should be spent, with big balloons, a party hat and a candle in your favourite bone. Forcing my family to sing happy birthday to him, he sat at the table and soaked it all in like a proud child. It would’ve been a crime not to take a photo! I arrived in Gjirokastër with few plans and little information; my visit to the small, southern Albanian town was a last minute decision following a recommendation by a fellow tourist I had met in the country’s capital, Tirana. I wandered into the town’s only hotel only to be informed that they were fully booked! I’d counted no more than four people on the streets of this tiny village, how could the hotel be full? The lady behind the desk registered my sheer panic and silently motioned me to come through into the back of the reception. She led me out the back of their small office, down winding cobbled streets and onto another building – her sister’s family home. With the hotel fully booked, I was overwhelmed to be told that I was welcome to stay here. This image was taken whilst wandering the streets of Gjirokastër, during the days I spent enjoying the warmth of this small town and my wonderful hosts. This is one of my all time favourite pictures taken whilst out walking when we were meant to be skiing! It was taken in winter 2009 in Maine, New England and captures the incredible snow perfectly (albeit accidentally!). We’ve actually got it framed at home because it encapsulates the magical enchanted nature of the forest we were walking through to get back to the lodge… where a large glass of red wine and a huge open fire were waiting. It brings with it fond memories as well as being a lovely photo in itself. I just managed to snap this when Charlie was taking his usual drink from the local natural sources. Given his dislike for the clean water that I put out for him, it’s a bit of a rarity as well. I love it because of the lighting, the location in Sowerby Bridge, the natural pose… it kind of encompasses everything about walking a dog, and I love that it’s part of our evening manoeuvres in the beautiful Happy Valley. Oh, and the fact that he’s clean since it’s the start of our walk. I took this on the way into the Sistine Chapel in the Vatican. The corridor went on for what felt like miles and the room was so packed that I wasn’t sure I was even walking, more like surfing the crowd. Not one person was looking forward, though, because all the ceilings look like this. So it was just a sea of crinked necks and murmurs of amazement. This is probably my favourite photo from my three week interrail trip. Not just because it looks nice but because of how excited I was of going to to the Vatican in the first place. It’s also a reminder of how much I want to go back. Before settling in Leeds I decided to pursue a career that let me galavant around the world, experiencing places and people that previously I would never have thought possible. Every week I was going somewhere different, working with different people and experiencing cities in many different ways. Of all the places I was lucky enough to visit, Tokyo was a step above the rest. Imagine the hustle and bustle of a normal city life. Now imagine this turbo-charged and flung into the future, technology is at the forefront of their culture but their traditions all remain. The Shibuya Crossing is branded the busiest intersection in the world not just for cars but the people that cross there. A crazy insight into life in Tokyo, a city that never sleeps! Dubai was one of the most special places I’ve travelled to – amazing culture, architecture, people, food, beaches and nightlife all in one. 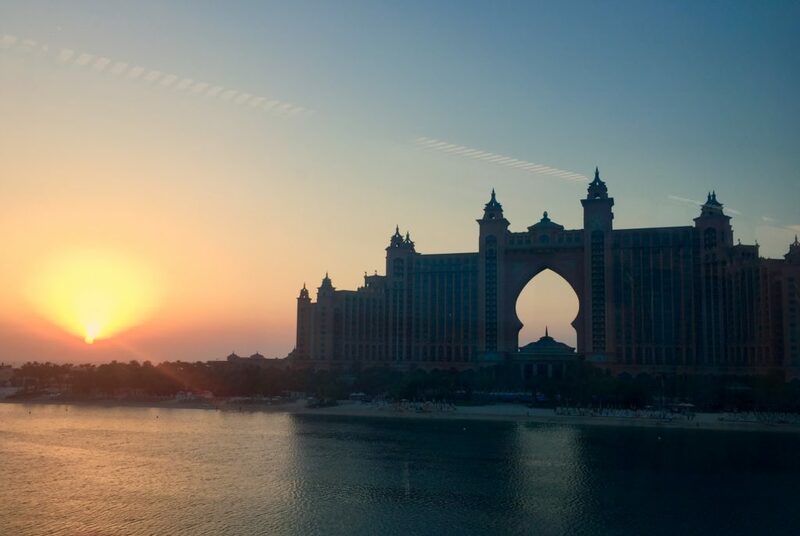 This photo was taken, quickly, on the monorail back from a trip to the Palm and the beautiful hotel building against the sunset was something I won’t forget. This photo brings back some amazing/unpleasant memories of slumming it with mates in some far flung beautiful locations in the UK. After the initial frustration of not being able to see ANY of the amazing landscape, it soon became a charming characteristic of the trip. While I was studying at university I got my first GoPro, and as soon as I got back to the slopes I couldn’t put the thing down. This shot was taken above the clouds just before we started our last run down, at the end of a two-week trip to the French Alps. We didn’t know then, but the four of us would actually start post-graduate life spread between New Zealand, Japan, Canada and… Leeds! Of all the photographs I’ve taken on skiing holidays since – be them landscapes, action shots, or even wildlife – this simple capture means more to me than any other. It’s a doorway to the fantastic early memories created with a group of now lifelong friends.